As of now, there are 2325 billionaires all over the world, controlling assets worth $7.3 trillion in terms of real estate, cash, bonds and other investment tools. Both of these numbers signify a very important trend in the wealth creation landscape all over the world: New wealth is being generated at a faster pace than ever. Compared to last year, total number of billionaires has increased 7% meanwhile total assets controlled by them have increased 12%. Wealth-X, an independent organization which tracks and monitors world’s ultra net worth population and UBS, world’s leading financial services company conducted their second edition of ‘Billionaires Census’ to understand and analyze the composition and dynamics of world’s richest population. – University of Mumbai has produced more billionaires than IITs and IIMs combined. As of now, there are 11 billionaires who are Mumbai University alumni, compared to 11 from London School of Economics. The top three universities which produced maximum number of billionaires are: University of Pennsylvania, Harvard University and Yale University having 25, 22 and 20 billionaires. From India, Mumbai University is the only educational institution being mentioned in this list. – Within Asian cities, Mumbai has been ranked #4 with 28 billionaires, having combined assets worth $97 billion. 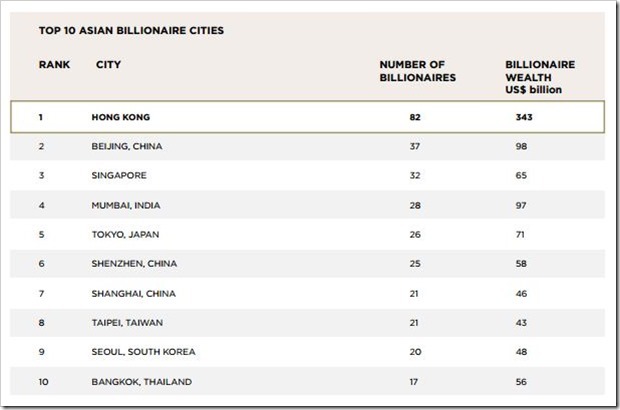 Hong Kong with 82 billionaires is ranked #1 within Asian cities, followed by Beijing with 37 billionaires and Singapore with 32 billionaires. Besides Mumbai, no other Indian city feature in the top 10 Asian city list. – Globally, Mumbai is ranked #11 in terms of producing billionaires. 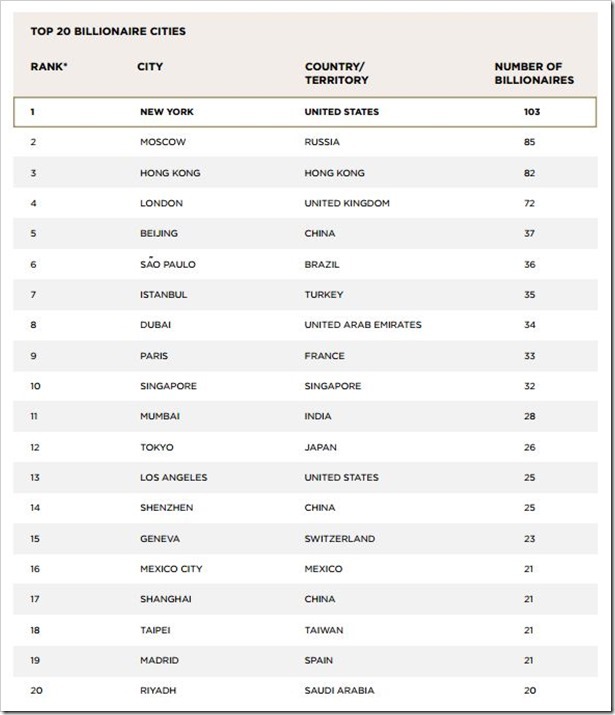 New York with 103 billionaires is rankled #1, followed by Moscow with 85 billionaires, Hong Kong with 82 and London with 72 billionaires. Again, there is no other Indian city mentioned in this power list of top 20 cities with most billionaires. – Overall, India has 100 billionaires as of now, having total combined assets worth $175 billion. Within Asia, China has maximum: 190 billionaires, controlling assets worth $440 billion. We are rankled #6 all over the world, in terms of producing billionaires, whereas China is ranked #2 globally. USA with 571 billionaires, having assets worth $2266 billion is ranked #1, followed by China and then UK with 130 billionaires, having assets worth $395 billion. – 63% of billionaire’s businesses are privately held, and 81% of all existing billionaires are self-made billionaires, using business and/or investment as a platform to increase wealth. The report specially mentions the importance and relevance of entrepreneurship to create wealth. The report predicts that by 2020, there would be 3800 billionaires all over the world. Technology and Engineering would be the sectors to produce maximum billionaires in the next 6 years. Europe as a continent produces maximum billionaires (775), meanwhile USA as a country has maximum billionaires (571). In fact, USA accounts for 25% of all billionaires in the world. This year, there were 57 new billionaires from USA alone. Here are some of the other findings of the report. 95% of world’s billionaire’s are having worth between $1 billion and $10 billion. Only 16% of billionaires attended any educational institutions; Overall, more than 700 colleges and institutions awarded graduate degrees to these billionaires. Check out this video that gives you everything you need to know about World Billionaires in 3 minutes! "More Billionaires In Mumbai Than Tokyo. Ranked 4th Wealthiest City In Asia", 5 out of 5 based on 1 ratings. Govt Launches Official India Trip Discovery & Planner App. And, It Works Great!